Their beloved Jimmy is coming home. On Monday, the family that founded Give Your Voice, a World Trade Center civilian advocacy group, got the news they dreaded and so desperately wanted. 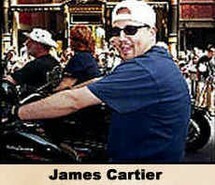 The remains of James Cartier, 26, an electrician killed on Sept. 11, were identified through DNA. "Having Jimmy come home in some form is a relief I can't explain," said Michael Cartier, 24, of Queens, one of the victim's six brothers and sisters. The Cartier family founded Give Your Voice in the weeks after the attacks because they believed families of civilian victims weren't properly informed about the recovery of remains. They always said their cause was to honor James. In recent weeks, the family steeled itself for the possibility that his remains might not be identified. Of the 19,192 remains recovered, the medical examiner has identified 968 people. "We'll have a place to go to cry, to put flowers down," said Michael Cartier. "My heart goes out to the people who won't get anything back. It's a scary thought. If anything, this has ... made me feel stronger in making sure that families have the right information."